Closest matchup: Two near upsets ended in anticlimactic ties this round, with Super Smash Bros. Brawl falling to Super Mario Galaxy 2 and Monster Hunter Tri falling to Castlevania: Dawn of Sorrow based on site rating. Monster Hunter's loss was particularly close, as it was edged it out by a mere .02 points. Biggest Blowout: Super Metroid and Super Smash Bros. Melee both lived up to their reputations as all time classics as they pummeled Nintendo Land and Super Mario Bros. 2 respectively, but it came as something of a surprise that The Legend of Zelda: Skyward Sword claimed victory over Super Mario 3D Land by the same large margin. Biggest Upset: Having just missed out on two big upsets, those rooting for the underdog will have to settle with Skyward Sword, a 6 seed, taking down Super Mario 3D Land, a 3 seed. 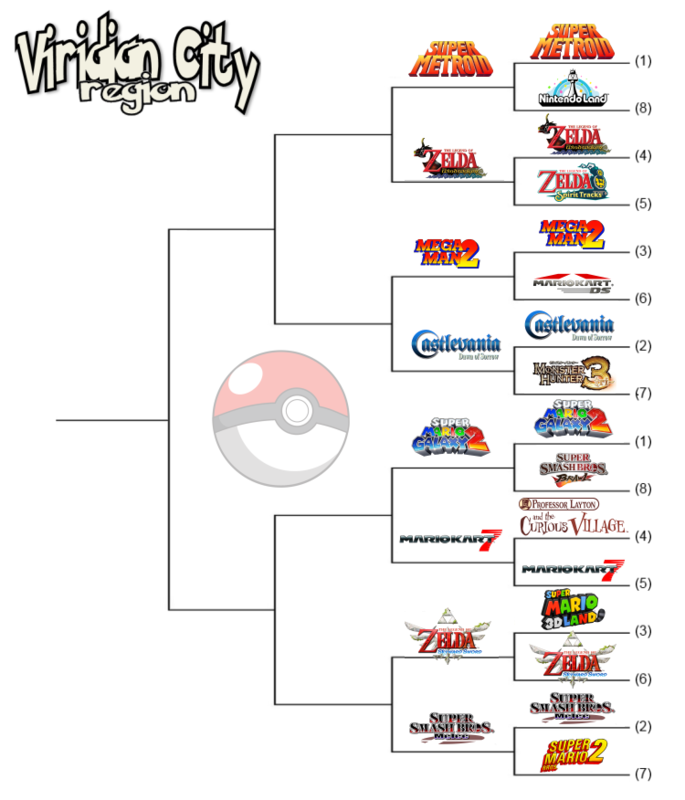 I would have loved to see a possible Smash Bros. showdown in the Elite Eight, but Super Mario Galaxy 2 is a great game and the best Smash Bros. in my book is still alive so I'm not too broken up about it. Wind Waker vs. Super Metroid is going to be my Waterloo. By which I mean Waterloo, the first big hit song by ABBA. Figure that one out, because I have no idea what I'm saying. Why did some of the winners disappear from the right side but not others? Just a space issue? I'm not surprised Skyward Sword advanced. Oops that means I accidentally hit cut instead of copy while editing the picture. I'll fix it when I get home. Dammit, Mop! Arrrrgh, NONE of the pre-Wii games are online anymore!